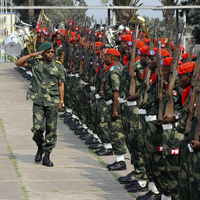 KINSHASA, Congo -- The local residents had been waiting for hours, and there was no guarantee they'd get in to the poorly lit room where administrators from the Forces Armées de la République Democratique du Congo (FARDC) were busy filling out paperwork. The U.S. Army and the FARDC were trying to register the Congolese civilians for a free health clinic that would take place the following week. The clinic, administered by military medical personnel from both countries, would be one of the culminating events of a two-week, U.S.-led exercise meant to improve the FARDC's medical capabilities -- all part of the "soft power" strategy advanced by U.S. Africa Command, based in Germany.